When we left Krabi Town we got a van to Ao Nang where the boat leaves from going to Phuket. The boat was a larger one, nicer, with inside seating on two levels or you could stay outside. The day was really hazy which was sad since we were traveling right through all the islands, but couldn't really see them. We later found out the haze was actually smoke from the Indonesia fires...not very good. We stopped by Railay Beach first to pick up more people. Since we were a bigger boat we stayed out far and the smaller boats brought the people to us. 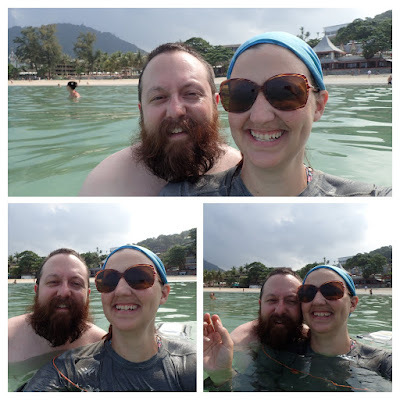 It was fun to see the beaches where we were swimming from out in the water instead of on shore. Once we arrived in Phuket Town it was very chaotic trying to find the right van to take us to our hotel on Kata Beach. The other passengers were not so nice - the one guy just gave me the stink eye and didn't want to move his small backpack so I could sit in the seat. I was just like dude, they are going to fill every available place. Your bag does not get a seat. Then a guy and his kid sat on the other side of me and the kid kept hitting me when he was wiggling which was fine, but the dad kept jabbing me really hard with his elbow when he went to get some water from his bag and stuff, and for no reason. There was plenty of room to not do so and he didn't even care. It was not the best van ride. We left the docks at 5:40pm and drove through Phuket Town and saw soooo many scooters and people in white ready for the big celebration for the last day of the vegetarian festival. With all of the activity and traffic and people it was much more like what I thought Bangkok would be like. Originally we were going to drop our stuff off where we were staying, on the other side of the island, then go back for the festivities, but we didn't get to our hotel until 6:40pm and the traffic was so bad going the other way we would have had to leave immediately. Who knows what time we would actually make it into town so we decided to skip it. Our hotel was super nice and on a hill so we had to climb up and down the stairs all day. I was cranky by the time we got there, but the guy at check in was so nice and friendly and smiley I couldn't help but be in a better mood. He was definitely amazing! And I loved how all of our towels and stuff were folded into animals. The view from our room out to the water. It really was beautiful even though it is hard to see at night. Once we got settled in we set off to find some food. Man I hated that. All of the people at the restaurants are sooo pushy! They are just constantly pressuring you to come in and eat and heaven forbid you stop to look at the menu. Then they won't leave you alone! The one lady just went through everything they had so quickly I couldn't processes it and it was way too much. This is why I didn't like Thailand so much. I hate the people who are always in your face and won't back off even if you say no thanks. It drives me crazy. We did walk by this one Thai place and Raymond stopped and the guy was friendly and asked if we wanted some Thai food. I asked if they had vegetarian options and I was super cranky as people were annoying me. Well they did! A whole vegetarian section (most of the other places didn't that we were able to look at). The guy was super nice. He started talking to us about being vegetarian and how it is the last night of the vegetarian festival and we were telling him about eating our way through Thailand with the festival. He was telling us how his sister keeps trying to get him to go vegetarian, but he just can't seem to, but he was so friendly and nice that we were happy to go inside and eat there. We laughed and chatted and had a really nice time. We ate there every day we were in Kata Beach and the guy running the place was awesome every time. He would come talk to us and I loved it! The food was really tasty as well - this night we had Pad Thai and vegetable curry - delicious! They also had connect four to play! And I lost one. It was a lot of fun. After dinner we walked around town a bit, but it was just touristy shops and people hassling us so we headed back to our room. The next morning was bright and sunny, though still a tad hazy. Our view of the water and the one pool. This was a lazy day, though not really as we don't know how to do the just laze at the beach thing. We were both exhausted by the end of the day. Breakfast was great - beans and toast, roasted vegetables, potatoes and fresh fruit. Delicious! There were more people than Railay Beach, but not that many so it was nice. I am glad we were there on the off season. It is so much nicer to not have crazy crowds. The tide was out so it wasn't very deep even far out and the water was gorgeous. We swam around all morning and it was so nice. I love swimming! I didn't see any fish which was great for me! Every once and a while a big wave would come and push us towards shore and then we would swim back out. It was fun, though we swam too long without putting on more sunscreen and Raymond's back and shoulders got so red! Not good! I had been wearing his long sleeve shirt since my shoulders got a bit read the other day, but he had been fine until now. Finally we got hungry so we sat on the beach for a bit to decide what to do for lunch. There were a ton of people walking around selling things - clothing, large crochet "dresses", pan flutes, all kinds of things. One guy was walking around with like 3ft Giraffe lamps. It was odd. Who is going to buy one of those? It was too big to fit into a normal suitcase so how would you get it home? Odd. We decided on the same place we had dinner since it was so tasty and easy. We dropped our stuff off in our room and headed out. Swimming around really builds up an appetite! And lots of noodles! So delicious! After lunch we headed back to the room to relax a bit then on to an afternoon of swimming in the pool! The one you could see from our room had more shade than the other one so we decided to swim around there most of the afternoon. I loved swimming around with Raymond. He is so silly! This was the first time we had ever really spent anytime swimming together. 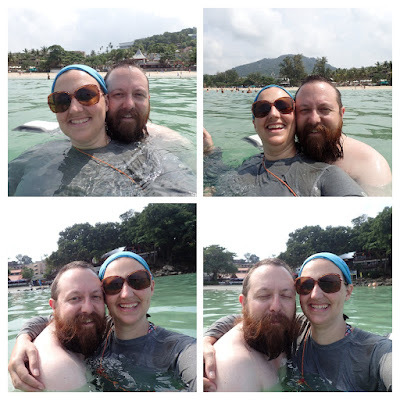 We had never taken a beach trip before, of if we did spend a day at a beach it was cold or one of us stayed on the beach to watch our stuff while the other swam. It was really nice. I just love being in the water. Eventually Raymond got too cold so he went back to the room (the water in that pool was chilly and without the sun it did get cold). I went to spy on the other pool and geez louise the water was warm. It was heated and hotter than it was outside! I couldn't stay in there very long, plus it was getting close to sunset so I went back to grab Raymond and head down to the beach again. The sunset was nice, though not as nice as the one on Railay Beach. After sunset it was off to find some dinner. I had looked up places to go and everyone, even the guidebook, recommended this pizza place so we thought we would try that. We searched a bit for it and when we finally found it there was a sign that said closed for construction until Sept 30...and it was Oct 22 so maybe it was just closed for good. So then it was alright, now what? Now we have to try and find someplace else in this sea of people annoying me and being persistent about us eating at their place. I had remembered I read a review of the one steakhouse that had mock meat options, and I thought it might have been the one we were next to so we check it out - and it was! They had one thing I could eat that sounded tasty and something Raymond wanted so we decided to eat there. We knew it would be a bit more expensive, it is a steakhouse, and kind of fancy, but why not splurge? Especially since everything else is so inexpensive. The hostess asked if we wanted to sit in the back in the garden so we said sure - and it was really nice. Lots of twinkle lights and live jazz music - a guy on a piano and a saxophone, and I really enjoyed it. The lady who seated us put our napkins on our laps for us and then the best part - they brought out cold towels for us! Like the hot towels you sometimes get places, but super cold like they had been frozen. It was heaven. And mine is the photo above - mock chicken, cous cous, mustard sauce and tempura veggies. So tasty, but a lot of food! Oh and we figured out how much our fancy meal cost - our entrees, drinks, and they gave us some passion fruit juice at the end of the meal all for $24! It was a steal! I was glad we stopped by there. I usually don't look at steakhouses as I figure I am not their ideal clientele and they probably don't have much I can eat listed on their menu, but this place was really nice and tasty! Afterwards Raymond was so tired he just wanted to go back to the room and be lazy and I consented. It was a long, tiring day of swimming!